Some collector’s sites mention different coloured material when speaking about variations, like white material or blue material. Have you ever wondered what this means? Or how you can tell the difference. This is referring to the different coloured pvc (Polyvinyl chloride) the smurfs are made from. Typically smurfs are blue or white but there are other base colours used. Blue PVC – W.Germany Schleich S © 1981 Peyo. 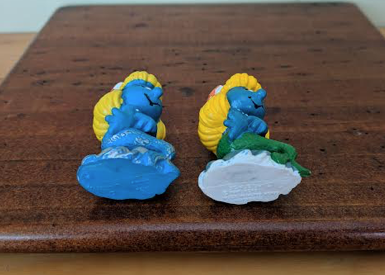 A really good example is Mermaid Smurfette (#20142), as she comes in both blue and white pvc and can easily be seen by looking underneath the rock. Some figures are easy to tell as there might be an unpainted area on the figure but others are more difficult to tell as they are completely painted. Typically you will find the W.Germany version with a blue pvc material and the Hong Kong version with a white pvc material which is then painted. In the early days when they were producing smurfs out of Hong Kong they would oftern use spray paint to paint the smurf. This may have been something to do with the huge demand for smurfs in the early 1980’s. A good example of this is Painter Smurf (#20045) and can be easily seen by looking around the smurf’s waist. A good tip it to look closely at the face especially the eyes and the hat to see if they have been painted and also at the bottom of the feet to see of there is paint missing. Depending what base material was used on the smurf can make a big difference when it comes to adding to one’s own collection. The best example of this is Rugby Smurf, especially with the ones in the South African team colours. More recently you are unlikely to find their variances with the base material like the ones produced in the 1980’s. This is because the smurfs are now produced out of the one place and not multiply places. The other thing is that Schleich is producing smurfs for shorter periods. Happily collecting smurfs can never be called boring.